REDONDO BEACH, Calif. -- It's a sign of the times. An Instagram photo shows a man missing a humpback whale surfacing just two feet away from him because he was glued to his cellphone. Photographer Eric Smith, who shared the photo on Instagram using the hashtag #ABC7Eyewitness, says he was about 50 feet away when he captured the moment, and the man on the sailboat in the picture missed the whole thing. "The whales were breaching off Redondo and this small sailboat maneuvered into the spot where the spout occurred. I was roughly 50 feet from the whale and her calf when they resurfaced next to the sailboat. The guy never looked up from his phone throughout the entire breach," Smith told Eyewitness News. 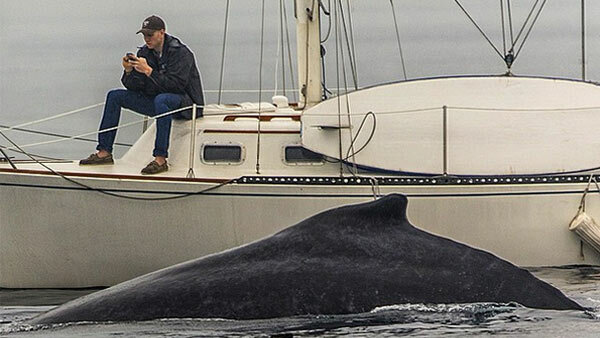 Smith said he had about five photos of whales with the private sailboat in the background, but the guy never got off his phone in any of the pictures. "We're all guilty being buried in our phones, even me," Smith said. "You think life is better on your phone, but we're missing what's happening around us."